I decided that I needed to go to the grocery store to pick up a few things. I was out in the country, driving slowly, all alone, going over a bridge at about 2 pm on a sunny springtime afternoon in April 2012 when all of the sudden I see something coming up from underneath the bridge. From out of the passenger seat window and about 5 or 6 feet from me I can see something medium gray.....as it came up a little bit more I could see part of a wing, part of a beak, part of a head crest, and a big gold eye like a cats eye. It looked as if it was struggling to get up over that bridge and up over my truck because of its heavy weight. As I slowed down even more and looked at it closely the first thought to enter my mind was 'prehistoric' and my second thought was 'it looks like something that shouldn't still be living today'. My 3rd thought was 'prehistoric bird'. I then watched out the windshield as it flew up over my truck, up into the sky, and off toward a wooded area, southward. It seemed as if everything was in slow motion as I watched it fly up above my truck and fly away. I watched it's wings above me and how they looked and moved. They moved like a muscular wave from one end of the wing to the tip. The wings were thick like a steak,were shaped like an airplanes wings, and had three sections to them, with black creases or wrinkles running down them. And on the middle outside of the wings were what looked like fringes (which I found out later were claws or fingers). Next, I noticed the torso, how big in was and that it was shaped kind of like an egg, and then the head crest and how strange it looked up on top of the head. And how the head crest kind of bounced up and down as the creature flew. I also noticed the length of the neck. I noticed the legs and the tail. How the legs just floated in the air and kind of bounced on each side of the tail. And how the tail had a heart looking shape at the end of it. I also noticed that it had no feathers and that it was probably as big as a small airplane, and bigger than my little Chevy S10 pickup. I was in some kind of shock the rest of the day,just walking around and trying to function in some kind of a daze, going through the motions but only really half way there. My mind was trying to come to terms with what I had seen. I contacted two of my friends who suggested that what I had really seen was a Heron, Albatross, Pelican or some local big bird, even though I told them that this creature was huge, not big and had no feathers at all. Next, I contacted Cornell University Ornithology Lab and spoke to a lady named Laura. She said that there are no birds that match my description. Next I did an internet search under 'prehistoric birds'....but kept coming up with posts about Pterosaurs. I didn't really know what Pterosaurs were but I knew that they weren't birds and that they didn't exist any longer (or so I thought). So I became discouraged and gave up until early 2013. 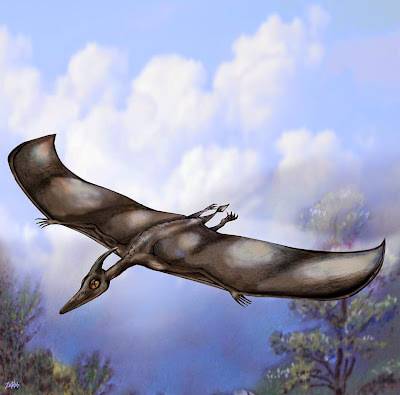 In early 2013 I decided to do another internet search under 'prehistoric birds' and up popped Jonathan David Whitcomb's name and the word Pterosaur again. This time I decided to contact this man via email and he responded to me and wanted to do an interview. During my interview with him I discovered that what I had seen was probably a Pterosaur. Now, all I had to do was come to terms with that. 1) Wings from tip of one wing to tip of the other: no smaller than 14 foot (maybe longer). 2) Face, bill and eye to the end of (tip) the headcrest: 3 to 3 1/2 foot long (the headcrest was shaped like the prongs of a household hammerhead (kind of a horn with a curve in it). 3) The whole animal from the tip of its head to the tip of it's tail was probably 9 foot to 12 foot long. 4) It's eye was no smaller than 5 inches around. 5) It's torso was probably 4 foot to to 5 foot long and shaped kind of like a lemon.....only longer (an elongated lemon). 6) Even though the tip of the Pterosaurs left wing was 5 or 6 foot from me as it was coming up beside my truck I could not see the tail until it was up in the air and above my truck. I want to say that the tail was 2 or 3 foot long. I remember the tail being just slightly longer than the feet as it was flying above me. It was the tail flange that was a little longer than the feet. The feet where like claws or talons floating in the air behind the creature.And the tail had a spade shaped flange at the end of it. It looked to be about the size of small airplane....and bigger than my Chevy S10. Why Believe in Living Pterosaurs? This is an amazing article...I,too,live in the central part of Arkansas. 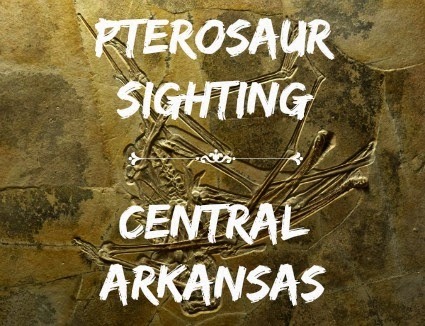 Lon, I'm an avid reader of Phantoms and Monsters, I was just thinking the other day that Arkansas must be a pretty safe state from cryptids and/or the unexplained because I've never read an article from you based on any sightings in Arkansas. I'm extremely curious to know where at in the vicinity of Arkansas this lady had the sighting? Thanks for sharing this info with us, Lon. If the sightings only happened in the USA on one or two ocassions then I can understand the tendency to dismiss the reports as those of remote controlled engineering creations causing confusion for any unwitting observers. But this ISN'T the case. There's hundreds of these documented sightings. It's close to unbelievable in the mainstream modern western world but the evidence suggests that a bizarre creature which once mimicked a pterosaur millions of years ago has out-lived it's prehistoric companion. These sightings ARE REAL. First of all: I am College Degree holder in Anthropology. Also did field investigation for MUFON in last 80s and into mid 90s. Currently a private Paranormal Investigator. My brother (whom had the sighting as well) is also former MUFON/NICAP 1970s and currently Vice President for fortune 500 company in the IT field. I’ve seen it as well as he. It looked directly at us! And paced back and forth along the shore for approx distance of 30 feet in total. We didn’t wait around to get a better view of it! Once we saw the head crest. It was a Pterosaur period. Not something I want to see again in this life time because its Momma will be at least 18- 20 feet tall. People are not reporting them because. 1 In flight there is no way of judging length and they may very well be soaring at height were they simply appear as small plane or other bird. 2. It simply to bizarre for the mind to comprehend and thus the sighting is pigeon holed into some type of logical rational explaining. Instead of a freaking dinosaur.